You may have heard of this lot so i'll keep it short, I first heard about the Manics via a bloke called Lol Prior who had got a copy of their first single via the NME small ad's, I sent off for a copy and got a really nice letter from James with it, the single was 'Suicide Alley' which they had released themselves with a bit of help from a local studio. The single was great, really refreshing at a time when even the mention of the word PUNK was treated with total derision, they were young, punk and very exciting, they mentioned that they had a gig at a pub in Great Portland street called the Horse and Groom. This was not a venue i'd been to before basically a small room upstairs via the back of the bar, god knows how they got it but I went along and they were great, full of energy, chaotic, even in a room with no stage and a crap p.a. First release was a 12" black vinyl with black & white labels (around 1500-2000 copies) then same thing with orange and silver labels, then a limited pressing of 3000 on Pink vinyl (there is only one pressing of this, some of them a bit dull and slightly mixed up on the colour) and a first time release on CD single, the first pressing had a black and white photo of the band on the label. From then on it's been a 12" with silver and green labels and a cd single with the three single reviews on it. 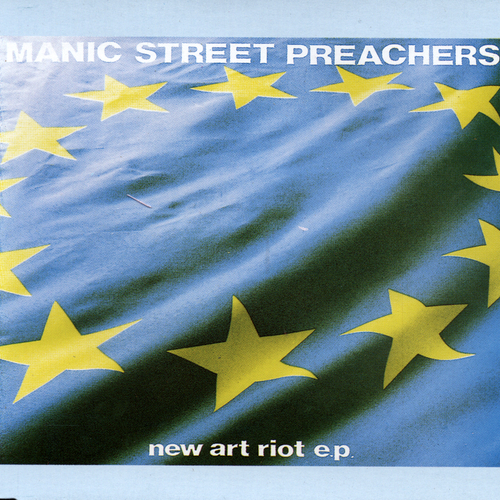 Unfortunately at this time we can't offer all the Manic Street Preachers - New Art Riot EP tracks as individual wavs, as some of these tracks exceed the shops maximum (9mins) download length.